It's safe to say that nearly 95% of our house, if not more, was built to contractor grade and never changed before we moved in. The brass light fixtures, unfinished bathroom mirrors, and bare bones closet configurations were three of the things that stood out to me most. 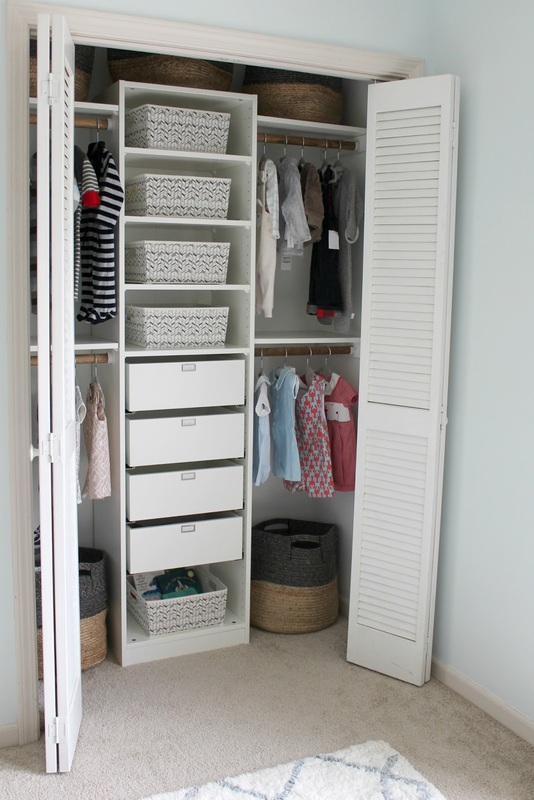 Earlier this summer when we moved in, we knew that the smaller of our two guest rooms would one day be the nursery, so we decided to leave it as is until we knew what we wanted to do with it. The great thing about the nursery is it was a complete blank slate. The walls were even still painted with just the coat of primer that the builders painted over sheetrock...over 20 years ago. Here's a peek at what the closet looked like before. 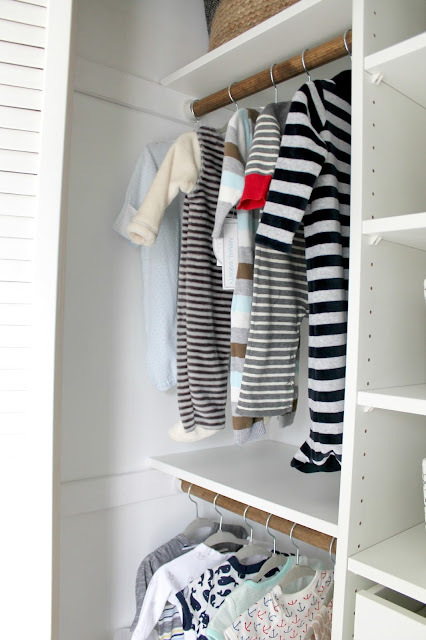 Old, dirty, and not the best use of space, especially for teeny tiny baby clothes. I originally figured we'd hire a good friend who's a contractor to help us rework the closet, not even thinking this was something we could tackle ourselves. But, after some brief browsing online, I realized it wasn't going to be so difficult after all. Enter: the Ikea Pax. 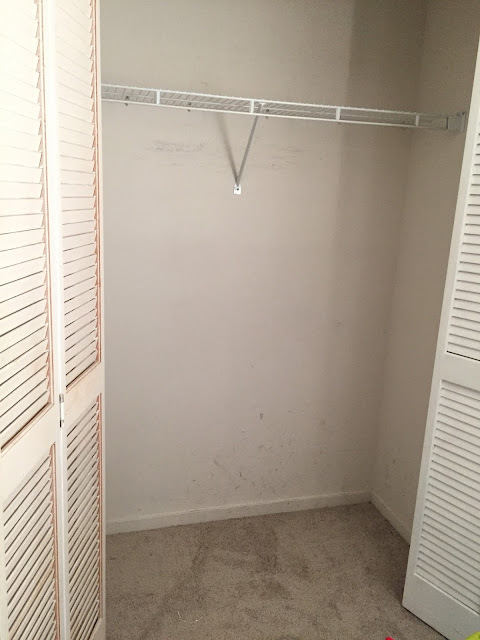 First things first, we got the boring part out of the way by removing the existing clothing bar, repairing the holes in the wall, and repainting the closet with a good coat of white paint. Next step, head to Ikea. Before this project, I had never purchased anything from Ikea. T and I went in there once to look around, and wound up getting so overwhelmed by everything that we left 20 minutes later. This time, we came with a plan. 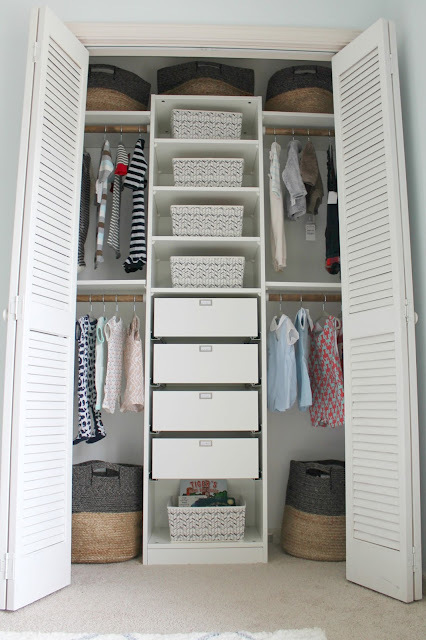 The closet is modeled after this post, and modified just a bit for the size of our closet. We were able to get all materials from Ikea and the hardware store. We started by assembling the wardrobe frame as the directions showed and positioning it in the center of the closet. My main concern about this was that it wouldn't be secure enough to the wall. They do supply you with materials to mount it to the wall, but it wasn't secure enough for my standards. Instead, we purchased three brackets and screwed two of them into the baseboards, and one into the stud behind the wardrobe. 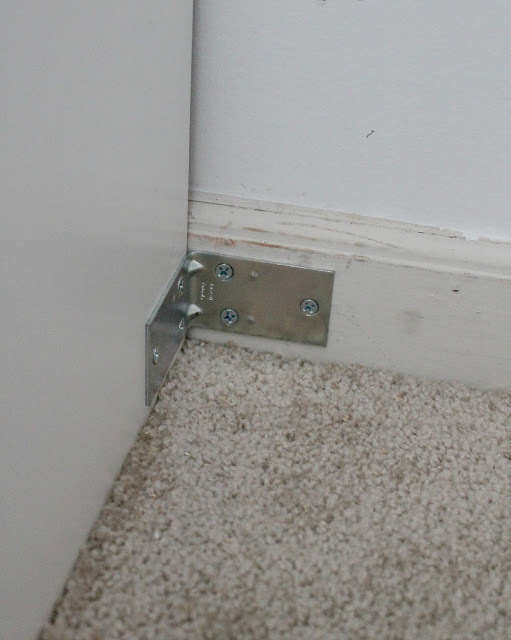 The stud wasn't completely centered over the wardrobe, which meant the bracket on top wouldn't be centered, but you can't see it when you're standing in front of the closet. I know how babies use anything and everything to pull up on when they're learning to stand and walk, so I wanted this thing to be virtually immovable. Once the wardrobe was centered and secured into the wall, I then cut 4 pieces of the the 1x3 plywood to fit the depth of the closet. 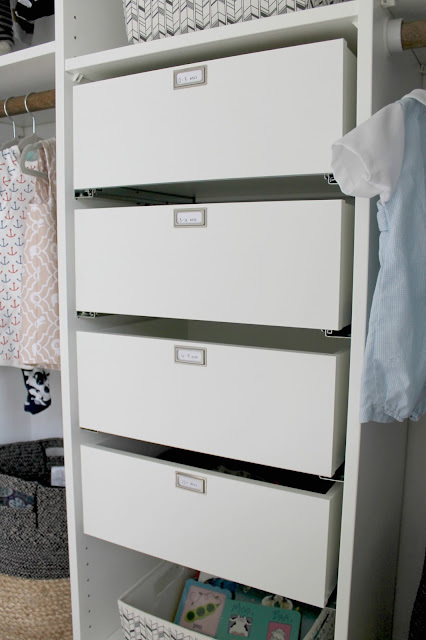 Once the wood was cut, I painted it white to match the inside of the closet. 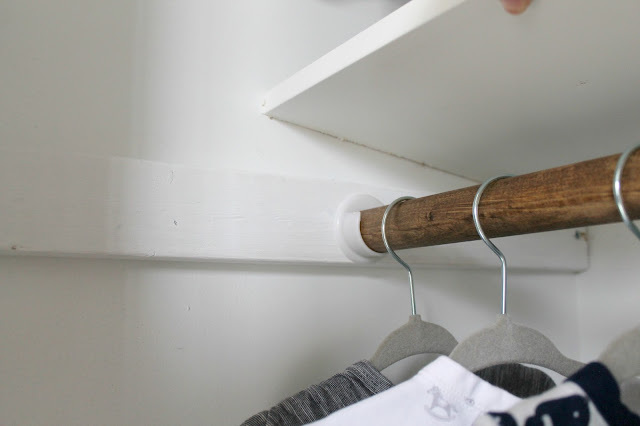 We mounted two slats on each side so we could hang two clothing rods on each side, securing each to the stud with long screws. I mounted the wood at 42" and 72". These heights are slightly different that what the "standard" closet rod heights are, but they worked for us. Once those were screwed into the wall, we screwed in the rod holders, and cut the wooden dowels to fit. I painted the dowels with a coat of stain to give them a little bit of color first. Next we cut the larger shelves to fit on each side of the middle wardrobe, they needed to be about 20" wide for our closet. Once cut, they rest on the 1x3 block on the wall side and then we used the pegs that came with the shelf to screw into the wardrobe. 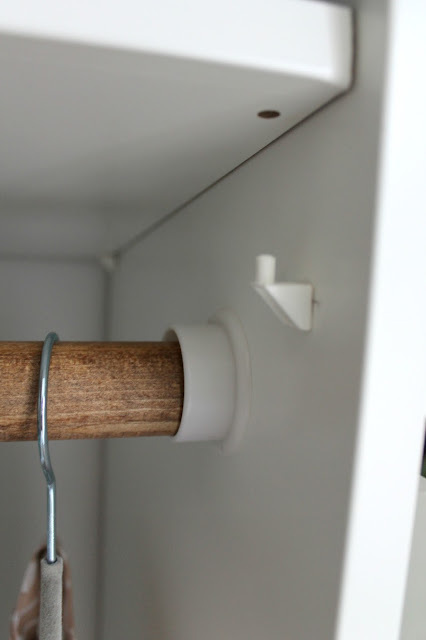 The pegs fit right down into the pre-drilled holes so the shelf won't slide. This is what it looked like after all shelves and rods were installed. 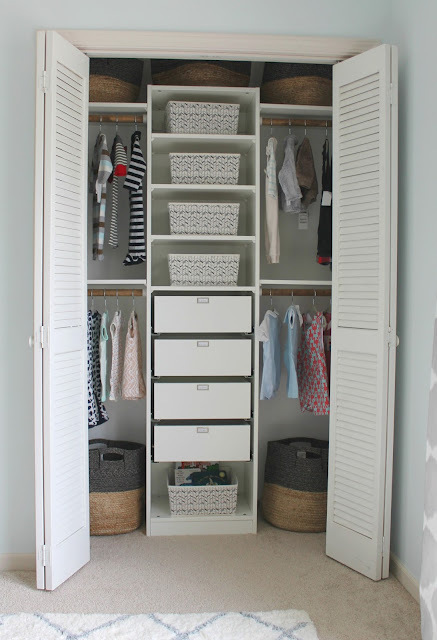 And then came the fun part, getting to fill it with all the cute baby clothes I've been collecting, and picking out baskets for storage. 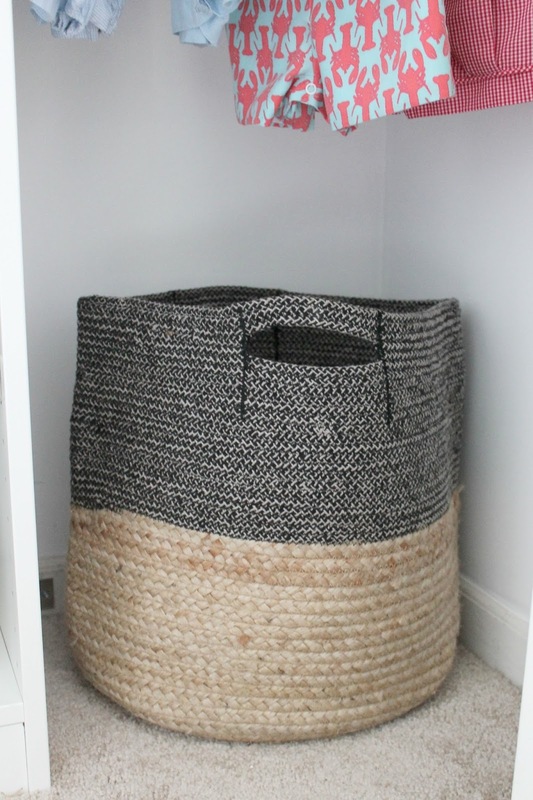 We found exactly what we needed at Target, and picked up 5 small structured baskets, 2 larger totes (similar here), and 3 smaller totes (similar here). I also purchased these adhesive bookplates to mount to each of the drawers for labeling. Right now they're labeled 0-3 months, 3-6 months, etc, etc, but as he grows we can switch the labels out to customize the drawers for what we need at that time. 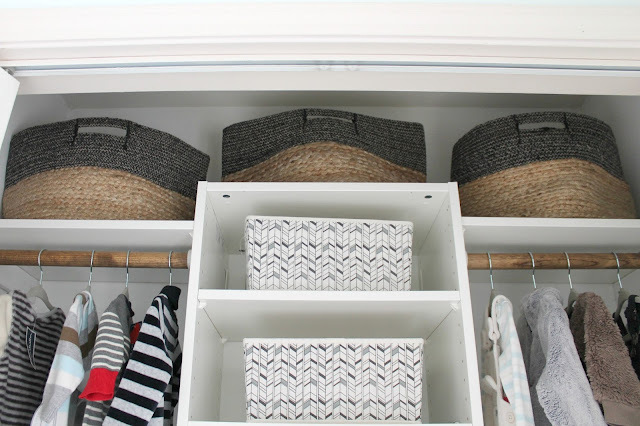 My little nesting self it just head over heels with this neatly organized closet. The rest of the room is in shambles right now, but getting to peek in the room and see this tidy closet makes me so, so happy. I was shocked at how simple this project turned out to be. I completed about 85% of it completely by myself, with a little help from my mom and T.
Now that the closet is finished, we'll be tackling the rest of the nursery. You can see a few glimpes of what we've done so far in a few of my pictures. We've painted the walls, hung curtains, and purchased a rug. And that's about it. We'll be getting our crib this weekend, so I hope that may be the catalyst for getting everything else into place. Even though we have 4 more months until this baby's arrival, I'm just so ready to have the room D-O-N-E. Please feel free to shoot me an email if you have any questions about this closet project! I'd be happy to help. This post could not have come at a better time! It's literally the next step of what I need to do (err, have someone do, I'm not handy!) in the nursery. Can I ask what the dimensions are of your closet? Our nursery closet is tiny- so I'm really struggling to figure out the best use of space. This looks so great! 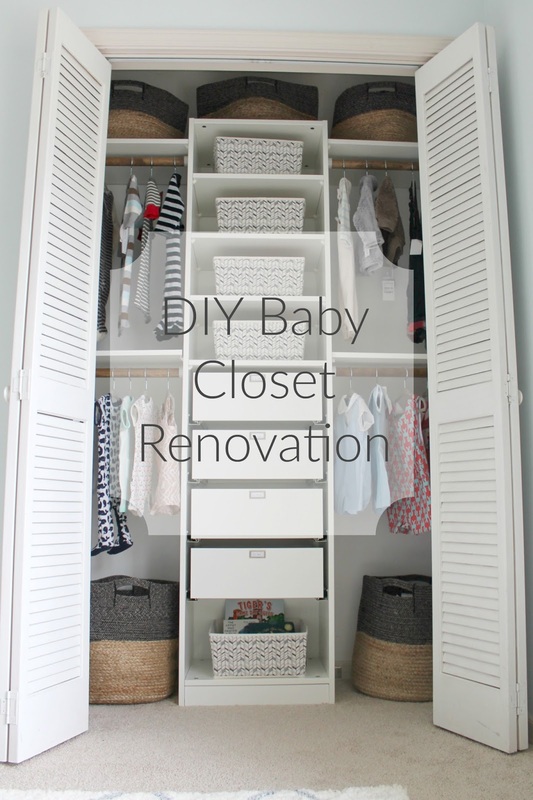 Will definitely be bookmarking to refer back to with our nursery! I am so impressed- looks great!! Yall are awesome about jumping on projects and getting things done around your house!